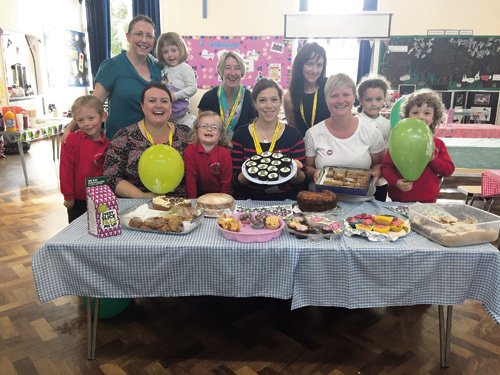 A HANHAM school tasted sweet success when they took part in the world's biggest coffee morning for Macmillan Cancer Support. Mums, dads and teachers from Samuel White's Infant School brought in a variety of cakes - from elaborate creations to shop-bought treats - which were sold in the hall, along with tea and coffee. Any leftover cakes were bagged up and sold in the playground after school. The event, organised by the Friends of Samuel White's, raised £500 for the charity. Friends' chairwoman Bryony Davis said: "It was brilliant and everyone really rallied round. We had a huge variety of homemade cakes and shop bought ones. People who didn't have the time to bake donated money instead, which was fantastic. "Teachers came in to buy cakes and had their morning break with us, which was really lovely. The event had a real community feel about it. "We raised £300 in the morning and £200 in the afternoon. People were very generous and put extra money in because they knew it was for such a good cause." The Friends will now focus their attention on raising funds for improvements to the school's outdoor areas. Fundraisers include a spooky-themed quiz night, discos, and Christmas fair on December 2, from 10am-1pm.